As drafted, H.R. 4143 and S. 2065, the Dialysis PATIENTS Demonstration Act seeks to promote innovation, efficiency and the improvement of the quality of care for patients receiving kidney dialysis. Stakeholders in support of the legislation have stated that they believe patient care will be improved through the fostering of greater integrative care for the end-stage renal disease (ESRD) population. The stated goals and spirit of the Dialysis PATIENTS Demonstration Act are laudable and of interest to most stakeholders within the kidney care community. However, as currently drafted and pending before the 115th Congress, the Dialysis PATIENTS Demonstration Act is poised to significantly compromise patient access and referral to organ transplantation. Many kidney patients are potential candidates for organ transplantation. If enacted as drafted, this legislation will serve to establish financial and public policy disincentives for dialysis patients that would benefit from kidney transplantation. The goals of the Dialysis PATIENTS Act are nearly identical to those of existing ESRD models developed by the Center for Medicare and Medicaid Innovation (CMMI), including ESRD Seamless Care Organizations (ESCOs). In 2015, CMMI introduced the Comprehensive ESRD Care (CEC) model to allow providers of various sizes to participate, while placing geographic limitations on ESCOs to avoid fostering market advantages of large dialysis organizations. Early results from these models have been impressive, yet the jury is out regarding the long-term implications for kidney patients. The 21st Century Cures legislation, which will make ESRD patients eligible for Medicare Advantage Programs, will also help determine the viability of capitated care of the ESRD population. Why Is H.R. 4143 & S. 2065 Being Aggressively Advanced in the 115th Congress? The Dialysis PATIENTS Demonstration Act allows for-profit companies (large dialysis organizations) to bear full risk for the care of the ESRD population. For the first time, it will allow dialysis providers to acquire or create insurance companies with little or no effort, allowing them to be the at-risk entity (Medicare Advantage Plan). Given the substantial capital and regulatory dialysis providers to acquire or create insurance companies with little or no effort, allowing them to be the at-risk entity (Medicare Advantage Plan). Given the substantial capital and regulatory requirements required to assume risk, this will be an opportunity almost exclusively for the two largest dialysis providers, Fresenius Medical Care and DaVita Health. Provisions within the proposed legislation allow for patients residing in the service area of an “Integrated Care Organization” to be involuntarily enrolled in the program with the opportunity for patients to opt out within 75 days or annually. Hence, all Medicare covered services, including transplantation (Part A and B are covered) will be covered by the insurance product. Restricting the freedom of patients to choose their dialysis provider could be viewed as an impingement on the rights of a vulnerable population. Furthermore, the ability to choose providers serves as an incentive for innovation and improvement in the quality of care delivered regionally. Patients need to be able to promote quality and innovation with their feet. Do our patients or the nephrology community want to entrust the referral of our patients for transplantation to a large dialysis organization? How can the Organization disentangle themselves from the strong financial incentive not to transplant? There is no inclusion of the transplant community in the multi-disciplinary oversight committees. Alternative payment models (hospital ACOs) are the future of medicine, including the care of ESRD patients. These models are based on caring for a population, cradle to grave. Do we want to relinquish this care to for profit private sector companies? The Living Donor Protection Act (LDPA), H.R. 1270, is an important legislative priority that was introduced one year ago (March 2017) by Congressman Jerrold Nadler (D-NY) and Congresswoman Jaime Herrera Beutler (R-WA). The LDPA seeks to promote and protect living organ donors from discrimination. The AST has worked collectively to lead efforts in advancing the legislation in the current 115th Congress along with AAKP, NKF, ASTS, ASN, and others. The AST meets weekly with the offices of Congressman Nadler and Herrera Beutler on Capitol Hill as well as with many supportive stakeholder organizations in Washington, DC. Society leaders have also met personally with both Nadler and Herrera Beutler regarding the legislation. Nadler and Herrera Beutler both recently attended and addressed the AST Transplant Patient Summit in Washington, DC. Congresswoman Herrera Beutler and Congressman Eric Swalwell also stressed the importance of advancing the LDPA. Congressman Swalwell was one of the first Members to co-sponsor the legislation. The AST is working closely with Congressman Nadler and Congresswoman Herrera Beutler to potentially break out and advance individual provisions/pieces of the LDPA to expedite consideration and passage of the legislation. This important legislation continues to add co-sponsors, with 56 on the bill currently. Additionally, the AST has a call-to-action out on the Power2Save and AST websites. The Veterans Increased Choice for Transplanted Organs and Recovery (VICTOR) Act aims to increase veteran’s access to transplantation. Current legislation states that the VA requires transplants to be at one of the department’s 13 transplant centers. The VICTOR Act would allow those Veterans to be transplanted local community transplant centers. If a veteran requires an organ transplant and cannot travel to a VA transplant center, appropriate transplant care should be available in the community. This bill would enable veterans who are unable access care at a VA transplant center to seek care at a community transplant facility. On Wednesday, February 28, 2018, Senator Cassidy introduced this legislation. AST strongly supported the House passage of the bill and is now working with Senator Cassidy (R-LA) and the Veterans' Affairs Committee to advance the VICTOR Act in the Senate. The continuing resolution (CR) passed on February 9 to extended government funding until March 23, 2018. The stop-gap spending bill comes with several healthcare provisions, most notably a continued focus and emphasis on maintaining the increase in biomedical funding and resources for the National Institutes of Health (NIH). In addition, other healthcare provisions included one that permanently repeals Medicare’s Independent Payment Advisory Board (IPAB) as well as a provision from a previous CR to suspend the Medical Device Tax until 2020. The AST applauds the tireless efforts of two Members of Congress for casting their votes to keep the federal government open in the early hours of Friday, February 9th and immediately boarding flights to join the AST at the 2018 Cutting Edge of Transplantation (CEoT) meeting in Phoenix, Arizona. During their remarks at CEoT, Herrera Beutler and Swalwell discussed their commitment to ensuring robust, predictable and consistent resources for the NIH as well as their steadfast support for the Living Donor Protection Act (LDPA). Other healthcare-related provisions in the February 9th continuing resolution included extending funding for the Children’s Health Insurance Program (CHIP) for an additional four years. On January 24th, Alex Azar was confirmed as the next Secretary of the Department of Health and Human Services (HHS) following the resignation of former HHS Secretary, Tom Price, MD. Azar is a former Eli Lilly executive and is largely in line with Trump Administration policy changes on the Affordable Care Act and Medicare spending. He is expected to focus on opioid epidemic and reducing prescription drug prices. The AST’s Chief Executive Officer, Shandie Covington, spent some time in Washington at the end of February. 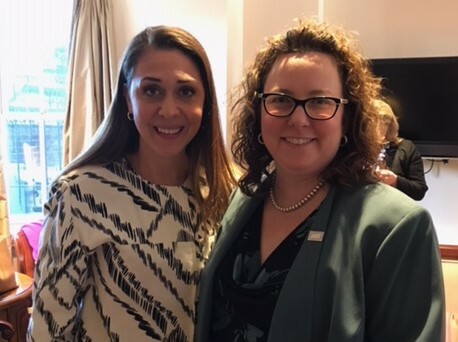 While in town, she met with Congresswoman Herrera Beutler and had the opportunity to discuss the Society’s thoughts on both the PATIENTS Demonstration Act and the Living Donor Protection Act. The Congresswoman has her own family transplant story, and serves as Chair of the Transplant Caucus.